Damn! Gas tank’s almost empty and now I have to stop for gas....but I soon learn that even the most mundane of tasks teaches us something. 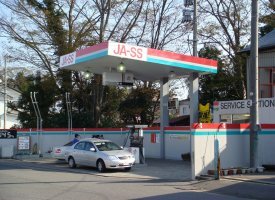 There is a gas station in the neighborhood, a very small one. It can handle three cars at once if they’re carefully guided in... and out by an attendant. But I like the place and that’s where I buy my gas. As I approached the station I could see that as usual it’s full so I stopped by the side of the road and turned on the blinker to indicate my intentions. All the attendants acknowledged me and I’m happy knowing that no matter how many cars line up from the other direction my place as next in line is secure. Within moments a car pulls away and an attendant motions me in. From the opposite direction an old man riding a scooter is approaching and as he arrives at the station he turns in. An attendant steps in front of the scooter and stops him, points in my direction and I think is explaining that I am next. The old man inches the scooter onward assisting the effort by pushing with his feet. A second attendant comes to the aid of the first and together they lean against the handle bars to stop him but the old man throttles up, bowls them over and parks the scooter by the pump, steps off, removes his helmet and then positions himself in a most erect and dignified manner as if in defiance of the way he had just been treated. I was content to yield my place in line to this old man. I watched as one of the attendants slowly approached the old man and bowed. The attendant then gently placed his arm around the back of the old man’s waist and slowly guided him to the side where he would be safe while the other attendant pushed the scooter to the end of the pump, still well within reach of the pump hose. He then signaled for me to pull in. One of the attendants filled my car and the other filled the old man’s scooter, it took less than two liters to fill the scooter, probably not even 250 yen worth of gas. The old man dug deep into his pocket pulled out a tattered coin purse and began to place shiny one yen coins into the attendant’s hand. I paid and was asked which direction I was going. I pointed in the direction from which I came; the attendant stepped into the street and motioned it was safe for me to go. As I drove away I took one last look in the mirror. The old man was carefully placing shiny one yen coins into the palm of a very patient young man.